Experiments were carried out at that ring point to determine the effects of aerosol injected into the stratosphere. My job consisted of working with the physicists and configuring real time Unix servers as well as setting up the initial websites to publish the findings of these experiments. It was at this time, after speaking with the physicists, that I learned exactly what was going on. Offline, these physicists would speak of the military’s interest in taking over these projects for their own private agenda, one I was not privileged to, as I did not have the necessary clearance. Although the pay was excellent, I eventually chose not to participate as I became more and more outraged with the knowledge that the eventual goal of this spraying of aerosols into our stratosphere, or SAG (Stratospheric Aerosol Geoengineering), was just a cover-up for a far greater and more sinister agenda: depopulation. I was made aware of this ultimate aim by speaking with physicists who converged on Upton from around the world. My decision to leave BNL caused me a divorce and blacklisting in the information technology field. Jobs were scarce for me, but I stood by my decision, not wanting any part of what was happening, regardless of the pay and benefits. Since then, these are the supporting facts of what I’ve learned doing my own research. — 20% of the Sun’s rays no longer reach our planet. — Solar Obscuration is the primary goal of SAG. 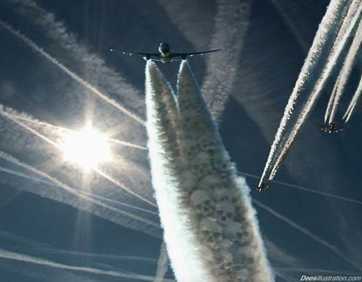 — Reduction of global warming by injecting particulate matter into the atmosphere as stated by geoengineers. Existence of a US patent for Stratospheric Welsbach Seeding for reduction of global warming—stated goal is to block the sun. First ingredient in the patent is aluminum. Rain tests have risen from 7 parts per billion (ppb) of aluminum filtered forest location testing, which, according to hydrogeologists, is quite high. Subsequent tests over the next five years have risen to 3,450 parts per billion in a single rainfall in the same testing areas. Similar assessments conducted by the California Air Quality Resource Board have confirmed these results (June 29, 2001). Sub-micron fallout is dangerous for human respiration with regards to highly reactive metal used, ie, aluminum, which is toxifing soil and water. The Entropy 2012 document reveals empirical data confirming Autism symptoms related to aluminum and acetaminophen exposure. Climate policy is under uncertainty as published in December 2009 with regards to the ecosystem of this planet. Solar Radiation Management introduces damages by means of an increase in the risks of destruction of stratospheric ozone due to SRM implementation. Moreover, sulfuric acid deposition can create health and regional problems. Also, recent numerical simulations show that SRM will affect precipitation patterns and volumes, causing droughts throughout large regions of the planet. Illness patterns coincide with heavy spray days in 1998, 1999, and 2000 during the winter months, specifically. In Peterborough, Ontario, 307 acute asthma cases were reported in one day of heavy spraying. In Birmingham, England, 8,000 people died during three weeks of heavy spraying. Geoengineers are purposing to dump 10–20 million tons of toxic aluminum and other unknown substances into the sky ostensibly for the purpose of cooling our planet. The World Meteorological Organization says that climate change is human-caused and has impacts on us now and those impacts will become more and more significant over time. The substances found in soil tests are exactly what are stated in the patents. John Holdren (Obama Science Advisor) has openly voiced his support for geoengineering. The Arctic Methane Emergency Group is openly calling for emergency wartime geoengineering.